"When I was growing up my parents held many dinner parties, and I always loved to help with the cooking. Mum would delight her guests with 12-course Cantonese style banquets, somewhat curiously completing the meal with an array of very Australian cakes and sweets! Mum’s butterfly cakes have won the hearts of many over the years – and now her gorgeous granddaughter Indy shows every sign of following in her grandma’s footsteps…"
2. With an electric mixer or a wooden spoon, cream butter and sugar together until light and fluffy. Add eggs one at a time, beating each in until well combined. Add sifted flour, milk and vanilla and mix until smooth. 3. Spoon mixture into patty tins lined with paper patty cases. Bake towards the top of the oven for about 15–17 minutes, or until golden brown. Remove cakes from patty tins and allow to cool. 4. 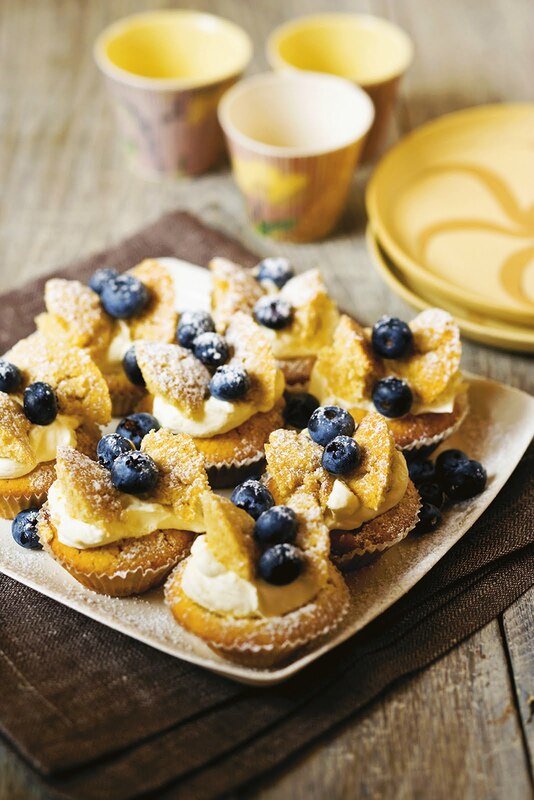 Slice tops off cooled cakes, and fill cakes with freshly whipped cream. Carefully cut tops in half and arrange these ‘butterfly wings’ on the cream. Sprinkle a handful of blueberries on and around each cake, then dust with icing sugar before serving. Click here to buy It Tastes Better (Book Depository). Click here to buy It Tastes Better (Booktopia). Wow this book and recipes look divine and inspiring!! Have a lovely weekend Louise!!! plagorism or copyright infringement? My blog has a lot of unique content I've either written myself or outsourced but it seems a lot of it is popping it up all over the web without my authorization. Do you know any methods to help protect against content from being ripped off? I'd certainly appreciate it. loads. I'm hoping to give a contribution & aid different customers like its aided me. Great job.